Today I received an email from the principal of my soon-to-be place of employment, the Sapporo Intercultural and Technological High School. That's right, we're placed in Sapporo, which is Japan's fifth largest city, the capital of Hokkaido island, and, most importantly, the beer capital of Japan!! As the island of Hokkaido is very much rural (by comparison to the rest of Japan), we feel particularly lucky to have been placed in the city, especially where Jacob is concerned. He's been polishing up his new (expensive) knives and reading everything there is to know about sushi in hopes of getting on somewhere in the back of the house (restaurant talk for "veggie chopper"). I think this will very much be a learning experience for the both of us. 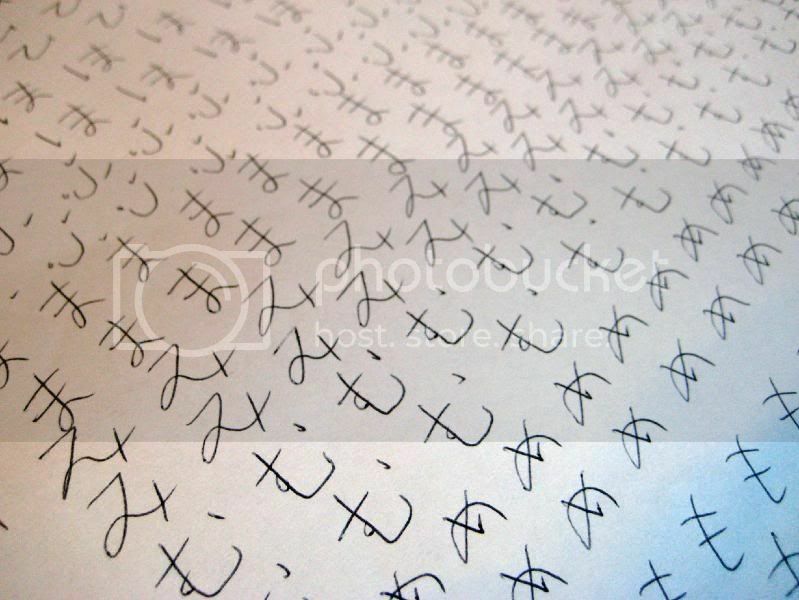 Japanese writing is somewhat complicated as it has four character sets: katakana, hiragana, kanji, and romaji. I've already gotten a good grasp on romaji, which is what I'm typing in now (basically, the Roman alphabet)! Hiragana and katakana (also lumped together as Kana) are both syllabaries, which have one syllabic sound per character. Finally, Kanji, the writing system borrowed from Chinese, is the hardest as there are literally thousands of characters each representing entire ideas, things, etc. 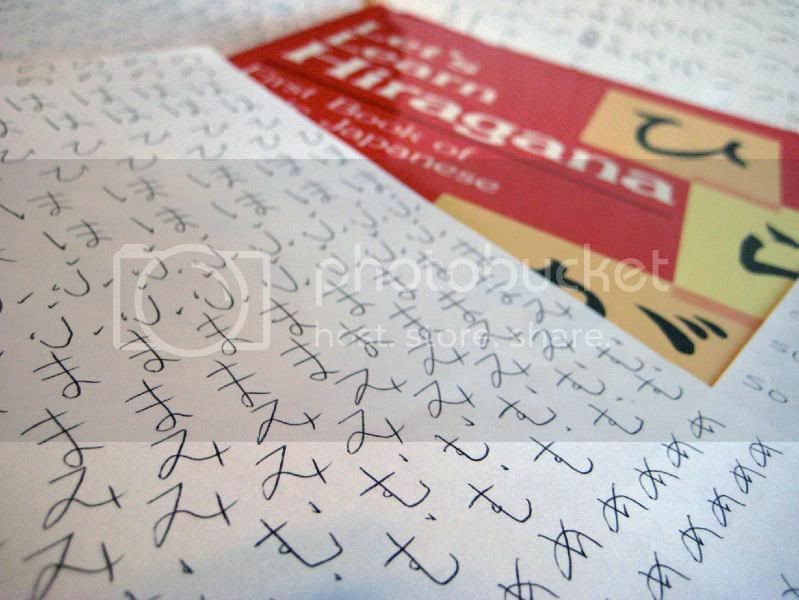 Of the two Kana syllabaries, hiragana is the hardest as the characters are more involved and "flowing" than katakana. 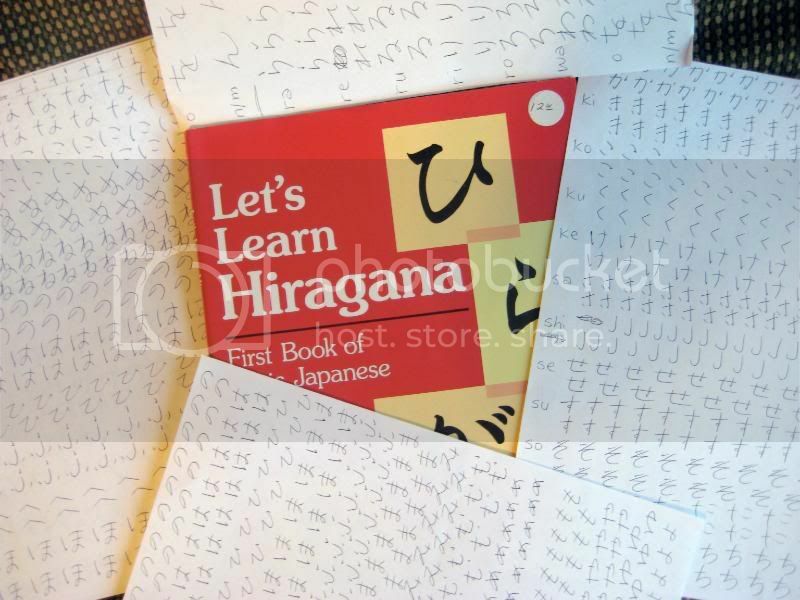 For every hiragana character and sound, there is a corresponding, simpler character in katakana (which is used for writing Western/foreign words, names, and the like). My uber-goal in this endeavor was to completely know and be able to use both hiragana and katakana before I depart for Japan-land. After writing and writing and writing these characters hundreds of times (read: eye-bleeding amounts), I've learned all of the hiragana, and about 20 of the 46 characters of katakana (which, being easier than the former, should take about a couple more weeks). Kanji will definitely be more of an undertaking.